Enough talk, let's just do it. Book Club. I'm pretty excited about this. As an online community and forum, this group has been nothing short of amazing, so I'm eager to learn from all of you. What you get out of these books is going to be different than my take away, and your perspective is important to me, so here we are. As usual, we aren't sure about the details just yet. We've chosen the first book, but we'll do a poll (we love polls!!!) for the next one. We know the discussion will take place in the Facebook Group. We know it will be fun. That's pretty much it. For our first book we've chosen one that I've referenced a time or two on the podcast, and Nate has been reading as well. He's found it very relatable, and I've been meaning to re-read it. 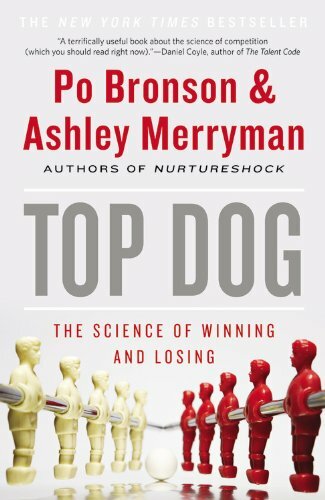 Top Dog: The Science of Winning and Losing, by Po Bronson and Ashley Merryman. I've included the link below that will take you to an Amazon page with a hard copy, kindle, and audio book available. As always, if you purchase through here, you're helping to support the content we're putting out, but it doesn't raise your price...just gives us a very tiny cut of the mountain of money that Jeff Bezos is pulling in. Let's say discussion will commence on Monday, April 9th? Nate and I will be running a series of workshops at SportRock in Virginia that week, so it seems like good timing.